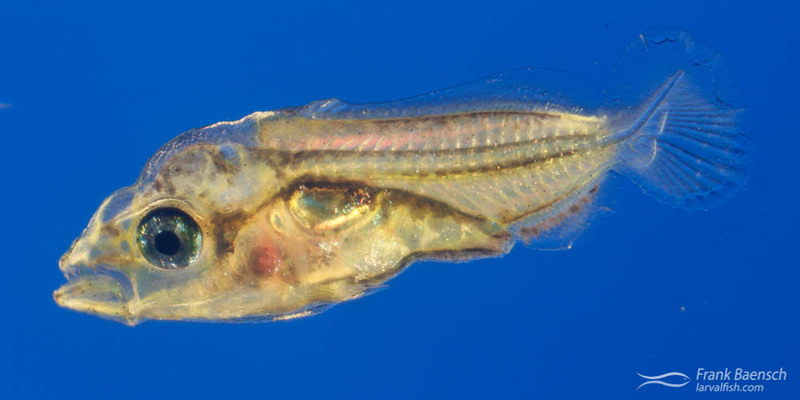 Black-lipped butterflyfish larvae (Chaetodon kleinii) were raised from captive-spawned eggs at 77-79F on wild and cultured copepods, rotifers, artemia and micro pellets. The larval duration was 94 days. First record of Butterflyfish culture from captive-spawned eggs. Butterflyfishes are mostly small, conspicuously colorful reef fishes with deep, laterally compressed bodies and small mouths. The family comprises 130 species in 11 genera. They primarily feed on benthic invertebrates, especially coral polyps. The striking chromatic patterns make butterflyfishes very popular among marine aquarists; however, many species have specialized diets, such as stony coral polyps, and fare poorly in captivity, refusing to feed. Interestingly, wild-collected, late-stage larvae of some of these species can be conditioned onto aquarium foods. Bottlenecks in adult spawning and larval rearing have kept butterflyfishes from being aquacultured. The Chaetodon genus is by far the largest among the Chaetodontidae, with about 90 described species. Chaetodon members reportedly have never been cultured. The larvae have complicated rearing requirements during the later stages, including a specialized diet that consists primarily of chaetognaths (Sampey et al., 2007). Adult Sunburst butterflyfish (Chaetodon kleinii) in Hawaii. Butterflyfishes rarely reproduce in captivity. The black-lipped Butterflyfish (Chaetodon kleinii) appeared to be a good candidate for captive breeding research because it is an exceptionally hardy, relatively small butterflyfish species that is common on shallow reefs here in Hawaii and spawns in pairs as opposed to aggregations. This species occurs throughout much of the tropical and sub-tropical Indo-Pacific, at depths from 13 to 400 feet. Two C. kleinii butterflyfish were brought into the RCT hatchery in the spring of 2015. The mated pair was collected off Oahu and conditioned in a 100-gallon tank on a mixed seafood diet. The pair spawned immediately after being introduced to the broodstock tank and then periodically following 3 months of photoperiod and temperature manipulation. Spawns of up to 2,500 eggs with 30 percent fertility were recorded. C. kleinii eggs are spherical, clear, contain a single oil globule and measure 0.7 mm in diameter. The larvae hatched at 2.1 mm TL with yellow pigment dots running along the notochord. They began to feed 3 dph at 2.6 mm TL. Bony plates, called tholichthys, formed on the head during the late pre-flexion stage. Flexion began near 18 dph at 5.6 mm TL and was completed near 25 dph (6 mm TL). The larvae had moderate to heavy yellow and dark pigment spots on the body through day 30 at 6.6 mm TL. The body of post-flexion larvae gradually took on a silvery appearance and the tholichthys plates became larger, extending from the head onto the body. The transformation period was long in captivity. The black bar through the eye and the white posterior margin on the dorsal spine first appeared near 65 dph (12 mm TL), full bottom orientation and juvenile behavior took place by 84 dph (24 mm TL), and complete juvenile coloration and meristic characters were present by 94 dph (27 mm TL). Sunburst Butterflyfish (Chaetodon kleinii) larvae reared in the laboratory. C. kleinii larvae generally suffered minimal mortality up to flexion, with a spike of high mortality during flexion, and gradual mortality during the post-flexion stage up to juvenile transformation. The larvae were raised in multiple tanks on various live food mixtures of rotifers, cultured copepods, and wild plankton. Only larvae fed predominantly wild plankton survived through settlement. The cultured C. kleinii’s 60-day post-larval duration is similar to that of other wild subtropical Chaetodon larvae (Booth and Parkinson, 2011) but the more than 30-day metamorphosis/transformation period appears to be unnaturally delayed. Aquacultured butterflyfish would be a valuable addition to the aquarium hobby, especially since the juveniles of many of the difficult to keep species could be pre-adapted to feed on aquarium foods. The experimental rearing of the Pennantfish (Heniochus diphreutes) and the black-lipped Butterflyfish (C. kleinii) sheds light on various biological bottlenecks, which are likely to considerably impede the commercial culture of this species and probably other Chaetodon members. Oceanic Institute intern Avier J. Montalvo, working in collaboration with Rising Tide Conservation, reported rearing Milletseed Butterflyfish (Chaetodon miliaris) in the spring of 2016. The larvae were fed Parvocalanus nauplii, enriched rotifers, and newly hatched Artemia. Over 50 individuals were produced. Rising Tide Conservation, in partnership with the University of Florida Indian River Research and Education Center, announced the aquaculture of the Reef Butterflyfish (Chaetodon sedentarius) in February 2017. The team used Parvocalanus sp., Brachionis plicatilis, newly-hatched Artemia, and Otohime A1 dry diet to raise the larvae. Juvenile coloration was first noted at about 70 dph. Survival was 0.1 percent for three individuals.